Last month I was lucky enough to find two free evenings where I went to play boardgames with some friends (El Grande Decennial, Notre Dame, Boardgamegeek game and Roma II). Having had very much to do in office (working around the clock) and almost no free time at all this was a very pleasant thing to do. One of my friends, a real board game geek, showed me a pre-order flyer of a game called "War of the Ring Collector's Edition" that he brought from a game fair (internationale spieltage) in Essen, Germany. War of the Ring Collector's Edition will release worldwide in December 2009 with a price of € 299,99. A second batch will be released begin 2010. This game is limited to 2000 copies worldwide (1500 English, 500 German) and will NEVER be reprinted. Don't miss this once-in-a-lifetime chance! Already it gets an impressive 9.61 rating at boardgamegeek.com! 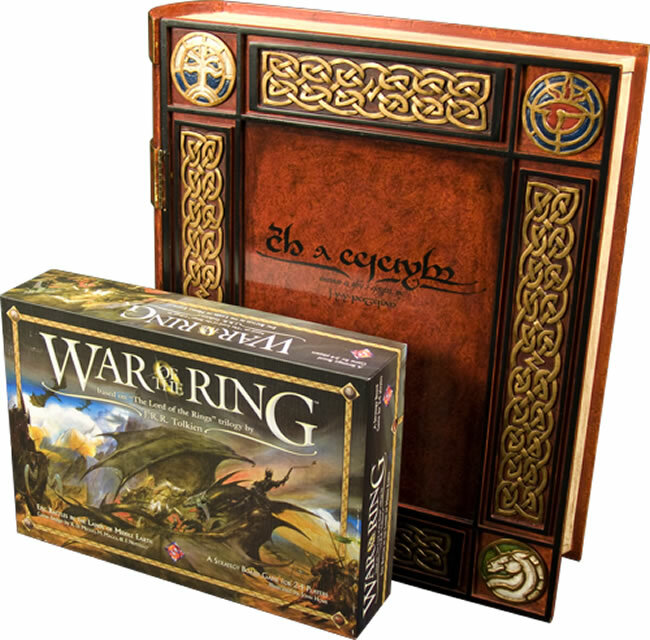 War of the Ring Collector's Edition is a strategic wargame in a fantasy setting where one player takes control of the Free Peoples, and the other player controls Shadow Armies. As with the standard version of this game, one can win a military victory, either as Sauron and the Shadow Armies if he conquers a certain number of Free People cities and strongholds, or with similar conditions when playing as Fellowship and Free People. The game may also be won by the Free People by completing the quest of the Ringbearer and trying to get secretly to Mount Doom to destroy the One Ring. Hidden movement prevents Sauron's awareness of the real intention of his enemies and keeps him looking across Middle Earth for the precious Ring. The Free People player must balance the need to protect the Ringbearer from harm, against the attempt to raise a proper defense against the armies of the Shadow, so that they do not overrun Middle Earth before the Ringbearer completes his quest. Limited and different choices are offered each turn through the roll of action dice which dictate the type of actions may be performed. The choices range from personal character actions to political and military decisions through which to develop your winning strategies. The War of the Ring Collector's Edition brings all that was in the base game and introduces factions, new characters and new events from the expansion, including Galadriel, the Balrog, the Ents, Dunlendings, Siege Towers, Catapults, Corsairs, and more. It is a complete game with updates to the original game rules and incorporates the expansion rules and cards to allow for new strategies to play out. This increases both the offensive options of the Shadow Forces and defensive options of the Free Peoples. This all-in-one version of the game is deeper, more comprehensive, and offers both more, and more difficult, choices of what path to pursue to victory, and where to spend one’s resources. The additional armies and characters of this version also enrich the theme and make it more true to the entire Tolkien saga of the Ring War. As impressive as this box is, it’s not likely to see much use. Once you’ve seen the 246 exquisitely hand-painted miniatures (including a special Gollum figure previously only available through promotions, and a never-before-seen Nazgûl figure) arranged across the updated board (25% larger than that of the standard edition, and featuring all-new art by the incomparable John Howe as well as elvish calligraphy by Daniel Reeve and David Salo), you’ll never want to put War of the Ring: Collector’s Edition back on the shelf! Inside, you’ll find an unparalleled attention to detail. An embroidered velvet bag is included to use for drawing Hunt tiles, and specially-molded marbled dice and updated tokens make up just a few of the high-quality components contributing to the aesthetic value of this awesome set. 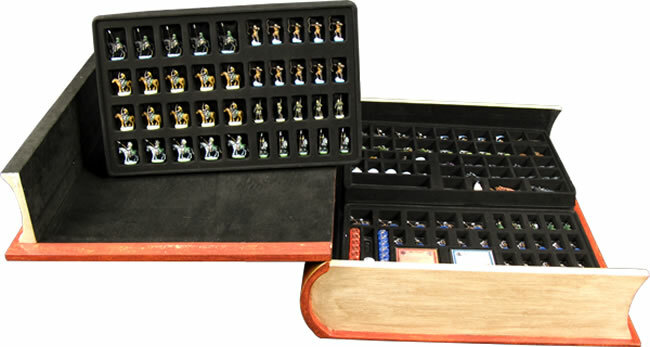 The 80-page rulebook, faux leather-bound and featuring a gold-embossed title, features several full page, full color illustrations by John Howe. 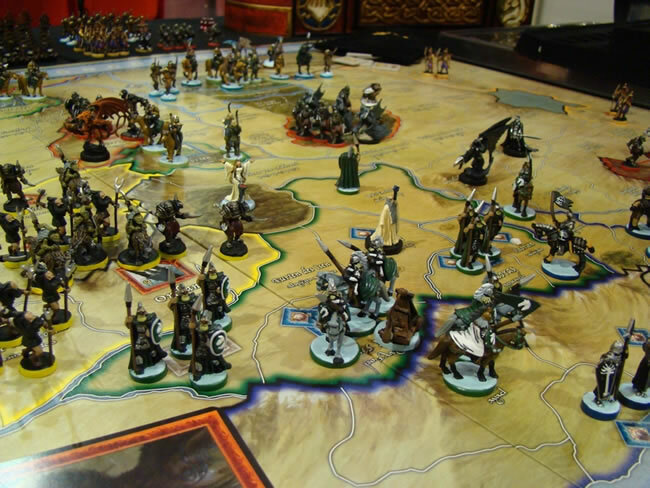 Speaking of the rules, the gameplay of War of the Ring: Collector’s Edition incorporates all of the base game mechanics that countless players have come to love over the years, as well as the components and rules from the Battles of the Third Age expansion (but the set excludes the extra boards for the battles at Helm’s Deep and Pelennor fields). And the cards have been updated as well; in addition to boasting clarified rules, the cards are larger than those of the standard edition, making their text easier to read! The result is a game that delivers in both visual appeal and gameplay, drawing in fans of gaming, as well as fans of J.R.R. Tolkien’s iconic work. After only a few moments of exploring the many offerings of this exciting set, it will become evident that quality was a guiding principle throughout the development of War of the Ring: Collector’s Edition. 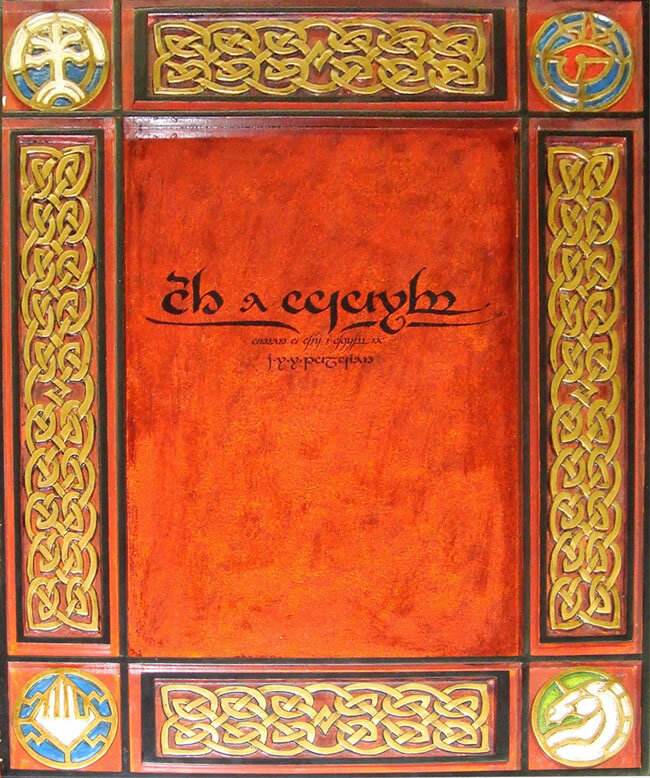 Don’t miss out on this exciting opportunity to own this impressive artifact, based on Tolkien’s genre-defining vision! I will put it on top of my wishlist for sure... no start hoping someone is crazy enough to get me this amazing game!